Oh and if i did something wrong on this post please tell me this is my first post. Well, your sig is MUCH to big, might want to fix that . EDIT: still to big, it should be about the height of your trainer card with about two lines of text. Last edited by dunsparce on Mon Jul 09, 2007 11:54 am, edited 1 time in total. hmm ok sorry,is this better? or is the two together still to big? 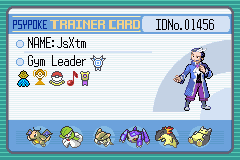 still to big, it should be about the height of your trainer card with about two lines of text. P.S. your sig will be deleted and your sig. privliges taken away after one warning if you don't follow the sig rules (I got a warning), there are basterds who will turn you in for psybucks so hurry up and change it! really like a wanted poster people turn u in for that kinda stuff?! Last edited by assazin on Mon Jul 09, 2007 7:01 pm, edited 1 time in total. Put the code into the Upload Avatar from URL slot in your Profile. Your sig is STILL to big (I will edit another entry into this post when I finish it). P.S. go to your paint program, set the height as 200 pixles in attributes, copy and paste your sig. in there and check the attributes again, if the height is bigger than 200 then it is too high, try having your sig pics. side by side, I don't know how to do that but I know it's possible . How do you like these? 1. es, their is an avatar limit of 75x75 pixels. 2. You do not need the code for avatars. I can make them avatar limit, I was just lazy. To: blazdude, the limit was changed to 70x70. nice,oh how do u get the avatar on your profile if u dont have the code thingy? I personaly don't know, if you right click on the images and select proprities then it will show you the URL. nice remember tomarrow only 3 days left! You CANNOT upload avatars from other websites, which is what the link to the image gives you. You MUST download Avatars to your computer, and then choose to upload them from your computer in your profile. Basically, click and drag the image, or right-click the image and select the option that says "download this image" or something similar. Then, in your profile, you select the browse option next to the "Upload Avatar from machine" option, and select the downloaded image.